The types of electric guitars are many since it is undoubtedly the most popular instrument. So many people identify with its sound, a sound that gives a voice to those who want to communicate through emotion instead of words. When I was a kid, I had a natural attraction to organized sounds. Music has always been a part of my life, whether my family was singing together at holiday gatherings or my friends where writing their favorite band names on their Trapper Keepers. Music is so pervasive in our day-to-day lives. Its always present, whether through the radio, in commercials, movies and TV, and even YouTube nowadays. As musicians became more visible through these media outlets, I became certain of the fact that the electric guitar is the epitome of cool. Then came the truly defining moment… My first electric guitar! You might be taking your first steps towards owning an electric guitar. You might be an intermediate player looking for a bit more history and information before adding the electric to your acoustic repertoire. What you can be assured of is by the time you explore this article you'll have a firm grasp on all of the electric guitar types and be able to narrow down which you want to entertain as your first, personal electric. 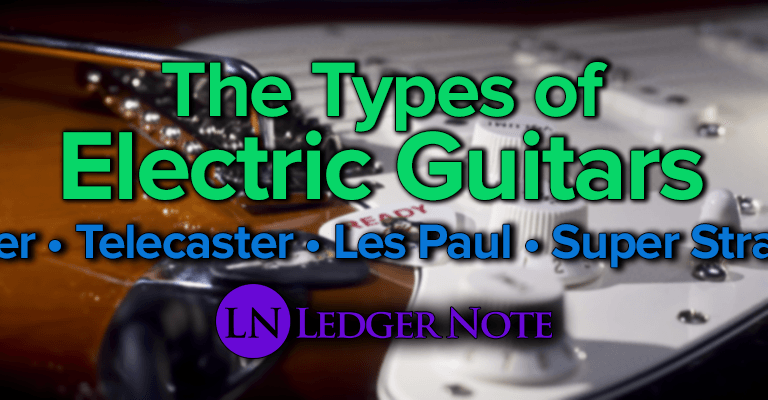 Let’s take a look at some of the main types and brands of electrics that have defined what we all see and hear in current modern music. Two brands are synonymous with this type of instrument: Gibson and Fender. Not only were they the earliest to bring the electric guitar to the masses, but the designs they created are still employed today, preferred by budding beginners and working professional musicians alike. Other companies have made their mark in the market by creating variants on Gibson’s and Fender’s original designs, but they are still identified through the names that the originals were given. Let’s check out the most popular of these designs before we pop over to their competitor's models. The Strat was an immediate hit with professional musicians when Leo Fender introduced it in 1954. While other solid body electrics had already been introduced to the world, many people would argue that none of them looked as cool as the Stratocaster. Leo Fender, alongside his trusted crew, realized they had hit upon a truly unique, world changing design, simply by trying to “one-up” their competitor, Gibson. This attitude led to the development of a distinctive image coupled with unique features that ultimately produced a sound that could not be achieved with a Gibson. Gibson originally offered a single cutaway from the guitar body, so that players could access higher frets. Notice that Fender includes a double cutaway design so the player’s thumb also has access to the higher side of the neck. Gibson used “3 On A Side” tuners, so Fender offered “6 Inline” tuning pegs. It was these choices that created a large part of the visual appeal of the Strat. “If Gibson offers two pickups, let’s have three!” This simple statement by Leo began a revolution in sound for electric guitarists by offering 3 single coil pickups instead of the usual 2 humbucking pickups that Gibson offered players. These lower output pickups provided a thinner sound, but with more tonal variants. Players could now have clear chunky rhythm tones alongside cutting trebly lead tones, while the inclusion of the middle pickup gave players access to the “spongy quack” distinctive of the Stratocaster’s “in between” positions. Another innovation by Fender was the Tremolo bridge, that used springs to let players alter the pitch of single notes and chords. Whether it was a vibrato type shake, or just dipping a chord below its pitch and back to center, the Fender tremolo bridge became a mainstay community, now a staple on all of the best electric guitars. As time went on, the discovery of the endless possibilities of techniques of this new spring-loaded bridge became apparent. We all know about a “whammy bar” and have probably gotten a taste for it through the Guitar Hero game series. A great example of a player who has mastered control of the whammy bar would be Jeff Beck, who in recent years has become the king of the subtleties available from the standard Fender tremolo bridge technique. If the Stratocaster became known for its Rock ‘n Roll appeal, then the Telecaster is the “Country Cousin.” It was actually introduced before the Stratocaster, and was originally known as the Broadcaster before Fender got sued for copyright infringement based on the drum kit called the "Broadkaster." The Telecaster has a single cutaway, which makes it easy to identify and separate from its rock ‘n’ roll brethren. There are other distinctive features that make it unique for a Fender and made it popular with Country guitarists. Instead of a Tremolo bridge, the Telecaster has what we call an “ashtray” bridge. This name came about from the original metal covering over the bridge that players decided to remove and use as an ashtray! Underneath that cover was where the magic was happening. Instead of six saddles, the original ashtray bridges had three that, in conjunction with its single coil pickup and larger metal surface, created a “twangy” sound that was perfect for any country chicken picker. The Tele is often called a workingman’s instrument for its simplicity. It also happens to offer tons of tone variants, just like the Strat. The neck pickup, with its distinctive “lipstick” look, can go from perfect blues tones to jazz, just by rolling back the tone knob. Danny Gatton was known to take full advantage of the many sounds the Tele could produce, even in one song, by rolling the tone knob to produce the “wah wah” effect that most players achieve through a foot pedal. Danny Gatton shows the versatility of the Butterscotch Tele in this quick lesson above. Both the Stratocaster and the Telecaster were created with modular parts in mind, so if any part was irreparably damaged, it could easily be replaced. Modern players have learned to take advantage of this feature by custom modifying these instruments to be useable in any genre of music, from Smooth Jazz to blistering Metal. Brands such as Jackson, Charvel, and Ibanez took the modifications that players like Eddie Van Halen and Steve Vai made to their instruments and used them to create what is now known as the Superstrat! These acrobatic guitarists used humbucking pickups and the more aggressive Floyd Rose style tremolo bridge to create the hard rock edge that began to be defined in the late 70’s and 80’s more technical playing styles. These instruments now include much higher output and even active electronic pickups, and their recessed cavities to allow the tremolo bridges to make the distinctive “dive bomb” effects that Van Halen made famous in his solo “Eruption.” Other distinct features include thinner necks and larger frets with flatter fret boards that many technical players prefer for their flashier techniques. Above, Steve Vai rips his Ibanez with a full-on orchestra while playing the Attitude Song live (it's nuts). These versatile Super Strats are capable of handling any genre of music, but have become most known in the “Shredder” and Metal styles that have spawned from the 80’s era of technical performance. If you are interested in playing these styles, the Super Strat may be just what the doctor ordered! We’ve previously discussed Gibson in comparison to Fender’s offerings, so it’s time to take a closer look at the more hefty Gibson guitars that were born during the same time period. In many ways, regardless of brand and style, any electric solid body guitar is a variant of these original axes from the 50’s. Yes, the Les Paul is a signature model for the late, great guitarist Les Paul. This signature instrument is one of the few models to ever have other famous players have signature versions of their own. The impact of the Les Paul has made it one of the most recognized instruments on the planet, due to its amazing versatility and high quality of craftsmanship. Ted McCarty, president of Gibson Guitar, tapped the famous guitarist Les Paul to help create Gibson’s first mass-produced guitar. They wanted to create a higher-tiered expensive instrument, and after a few prototypes they landed on a design that forever changed the future of music. The original Les Paul featured a solid mahogany body capped with a maple top, which produced an instrument capable of many tonal variants with maximum sustain. Although the first Les Pauls included two P-90 pickups, they are most well known for their two PAF humbucking pickups. While many variants are produced, the double humbuckers put the Les Paul in a league of its own, separate from the offerings of Fender’s Telecaster and Stratocaster. Other defining features include its 3 on a side tuners on a painted headstock, a bound neck and body with trapezoid or block inlays on rosewood or ebony, and its Tune-O-Matic bridge with the Stop Bar tailpiece. While some of these features are wonderfully cosmetic, the components such as the bridge set-up and pickup selection gave the Les Paul the massive sound and sustain for which the guitar is renowned. The finish choices on Gibson’s iconic axe also gave the series its visual appeal. This combined with the high level of craftsmanship supported its more intimidating price tag. From Gold Tops, Black Beauties, and the highly sought after original Flame Maple Sunbursts, there is a finish for everyone, especially including today’s variants. Many guitarists have chosen this iconic axe for its versatility and capability to sound great in any genre of music, but the Les Paul is most widely known for its heavy duty rock ‘n’ roll vibe. A great example of this would be Jimmy Page of Led Zeppelin fame. Once Page began using Les Pauls, he never looked back and helped to give the instrument its indelible place in the history books of music. The SG stands for “Solid Guitar,” and just like all of Gibson’s offerings, it is not only quite solid but famous the world over. The SG has an interesting history alongside the Les Paul. At one point in its early years it was even considered a Les Paul. We now refer to these instruments from ’61-’63 as Les Paul SG’s. There are many similarities between the two designs, such as the exquisite detail of the visual appointments, from the bound necks and headstocks to their trapezoid and block inlays. They both include separate volume and tone knobs for each of the two humbuckers, which can be switched between or used in conjunction with the 3-Way Toggle switch. Once you get your hands on one, the differences become apparent quickly though. Some of the different aspects of the SG include its much thinner double cutaway body that offered players easier access to the higher frets. This model is also significantly lighter than the Les Paul and was preferred by many players who wanted the heavier tonal offerings without the back and shoulder pain that can come after a 3 hour gig with a Les Paul. Tony Iommi, Black Sabbath’s guitarist and riff-master extraordinaire, is a perfect example of a player who took the SG to the extremes of sound, using the instrument to define the beginnings of modern metal. Check out any of Black Sabbath’s records to hear the heavy crunch of the SG. The double cutaway body and its higher fret access made the SG become the perfect axe for the slide guitarist. Duane Allman of the Allman Brother’s Band is one of the most highly revered slide guitarists of all time, and he chose the SG as his weapon of choice. Allman was even known to pass the fret board entirely and create notes in a high range that were not previously capable of being played with normal slide technique. Carrying on the tradition of his hero, Derek Trucks has taken Duane Allman’s sound and technique and forged ahead with one of the most soulful slide sounds ever to be heard. His uncle, Butch Trucks, was the drummer for the ABB, and Trucks began to play with the band at a very young age before becoming a full time member and keeping Duane Allman’s heritage alive for a new generation of listeners. Other well known SG players include Pete Townsend of The Who, Angus Young of AC/DC, Frank Zappa, and Eric Clapton. While Clapton is also known for his signature Fender Stratocasters, his SG, dubbed “The Fool,” helped to bring make the SG a mainstay. Gibson released a number of other famous guitars in the 50’s with their eyes set towards the future. They really nailed it, because these guitars still look like a time traveler created them, and have spawned copy after copy. Check out the most notable of these futuristic electric guitar body styles below. The designs are out of this world. This instrument was first released in 1958 and was immediately welcomed into the hands of great blues players like Albert King and Lonnie Mack. This electric guitar style has experienced surges and lulls in its popularity, but has never fallen off the scene, due to the number of great players who have chosen to use the Flying V, such as Jimi Hendrix, Dave Mustaine, Kirk Hammett and Michael Schenker. The Flying V offered many of the same benefits as the SG with a much more distinctive body shape. It is now a very common guitar among heavy rock and metal guitarists and will achieve its destiny of being a guitar of the future! Alongside its brother, the Flying V, the Gibson Explorer had a futuristic body design from 1958 that still appeals to many players today. A common theme with these models is the capability to easily access the highest notes of the instrument, alongside dual humbuckers and massive sustaining bodies. The Explorer, much like the V, is now a very common electric guitar shape in the heavy rock and metal genres, but was widely used in other styles as well. This is evidenced by one of the most famous Gibson Explorer players, Allen Collins of Lynyrd Skynyrd. The Firebird did have some other unique features such as its banjo style tuners and mini humbuckers that produced a different sound than the full humbucker pickups Gibson typically offered. Many notable players preferred the Firebird: Mick Taylor from the Rolling Stones used it on the album Exile on Main St. Allen Collins would also use this axe on stage with Skynyrd alongside his Explorers. The great Texan blues guitarist Johnny Winter was known for playing slide on his 1963 Firebird to great effect. Dave Grohl, of Nirvana and Foo Fighters fame, used his white Firebird to create a modern rock sound. Solid body and Hollow are just two of the electric guitar types. In many ways, the Semi-Hollow Body guitar is synonymous with Gibson’s ES series from 1936. There have been many variants produced by Gibson itself, as well as copies built by other companies, but they all hark back to this original design. Even though Rickenbacker first released the Semi-Hollow guitar, the ES-335 is now the mainstay in the world of guitar. The semi-hollow guitar is based on having a “tone block” that runs down the center of the body of the instrument. This reduces feedback issues while still maintaining the woody tone of the true hollow body instruments that are widely used in Jazz. This allowed the pickups to be mounted to a solid block, while the outer portions of the instrument are hollow, which are often adorned with “f-holes” much like instruments of the Violin family. This type of build provides the resonance and tone of fully hollow instruments, while providing a resistance to feedback that allows the guitar and amplifiers to be used at a higher volume. While these guitars are known for their warm woody sound, they are capable of being used in almost any genre that doesn’t require massive amounts of gain, which is prone to feedback. The guitarist for the Black Keys, Dan Auerbach, is a modern example of a player who will drive the instrument to distortion, but still maintain the jazzy blues quality these instruments are known for. Other artists, such as George Benson, John Lennon, and the world renowned B.B. King would use the instrument to its fullest capability to produce a clean, bright, woody tone reminiscent of fully hollow guitars, while being able to provide the volume levels to perform in much larger concert halls without the inherent issues known with fully hollow body guitars. The fully hollow body electric guitar is almost always a finely crafted work of art. These instruments are a throw back to the days of hand shaped acoustic instruments of yesteryear. The hand carved archtops and backs are designed to take advantage of pure acoustic detail, such as resonance and tone, while the electric aspect allows the performer to be amplified. A pure traditionalist could ask for nothing better tone wise, but must contend with other aspects of these incredibly resonant instruments. Most players will immediately think of the Jazz guitarist Charlie Christian, who brought the Gibson ES-150 to fame with the Benny Goodman Quartet. Many top notch players realized that the tone these instruments could offer was unparalleled, and began to use them in their own illustrious careers, such as George Benson and Pat Metheny, alongside the other countless masters that wield these masterfully crafted instruments. Companies such as Gretsch and Gibson are well known mass producers of these fine instruments, while custom makers such as Benedetto, D’Angelico, and Sadowsky, provide that hand crafted touch that comes with a hefty price tag worthy of the tone. We have taken a look at the many varieties of electric guitars available in today’s market (you can read about the types of acoustic guitars and even guitar strings as well). With this many options, it is wise to consider the genre and tone you are searching for by researching what your favorite artists choose to craft their sound. Your choice may be based upon visual appeal and cool factor, but make sure the instrument you choose is capable of producing the tone of the style of music you play from your heart! It's a large selection of body styles but hopefully now you're also comfortable with all of the sounds of the various types of electric guitars.